If you need to delete a transaction from a member or team record, ensure that you select the right transaction to delete, as once it is deleted it cannot be recovered. Please note that you can only delete a transaction that has been manually added. The process for deleting transactions from member and team records is the same. The below instructions take you through how to delete a member transaction. 2. Locate the member you want to update and click on the View Record button next to their name. 4. 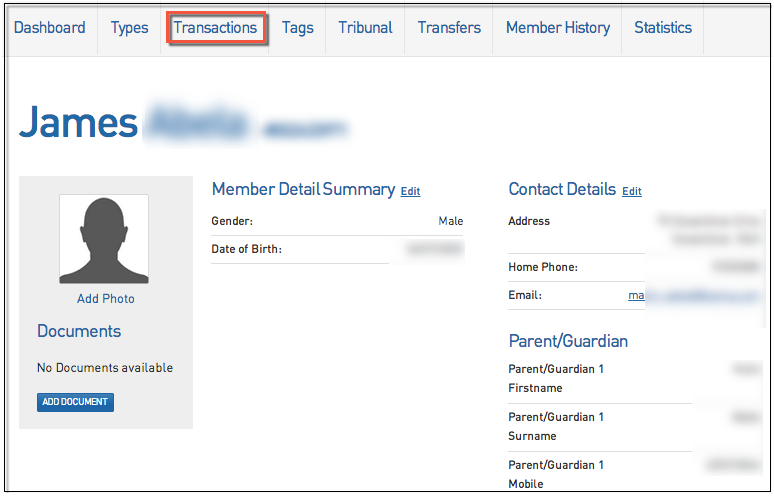 The member's 'Transactions' page will appear, showing their transaction history. Locate the transaction you want to delete and click on Delete Transaction to permanently delete the transaction. If you are attempting to delete a transaction that has been paid for, skip to step 6. 5. A message will appear confirming that the transaction has been deleted. 6. Transactions that have been paid for do not provide an option to be deleted. In order to delete a paid transaction, you firstly need to delete the payment record. Click on View Payment Record next to the paid transaction. 7. The payment record will open. Click on the trash can icon in the top right corner.